As the New Year begins, we see a frantic search for new goals and/or new resolutions. As you go through this process, it's extremely important to understand what is driving these goals and why they are important to you. In this blog, Coach Sam Smith form OPEX Fitness Headquarters, takes a deeper look at Intrinsic (inspired) and Extrinsic (motivated) Motivation. As you finish up your goals for 2019, you can use this guide to really connect to Inspired and Long Lasting Goals. What’s the difference between motivation and inspiration? Between extrinsic and intrinsic drives? Or are those the same thing? In this post, we are going to break down the differences between the two, see which one has more long term value, and how we can identify areas in our lives that hold deeper value and purpose. However, this external force, or motivation, is fleeting and quickly diminishes once the reward or goal has been reached or ceased. Same goes for extrinsic drives, once the task or object has been reached, we find solace in knowing our energy and strain can be relieved. 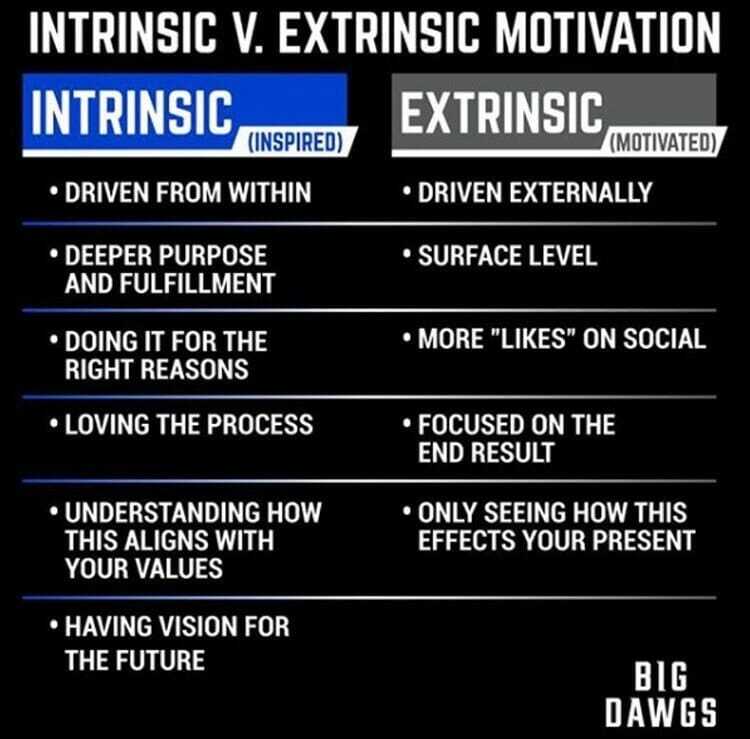 If we look closely at those short descriptions of being motivated and extrinsic drive, compared to being inspired and intrinsic drive, there are some significant differences between them. Let’s unpack those and figure out which approach carries the most utility long-term. I highlighted key words within each definition to draw your eyes towards them. We see a common theme where motivation/extrinsic drive is coming from a place “outside” ourselves. Pushing us towards a goal. In comparison, inspiration/intrinsic drive is coming from a place “inside” ourselves. Pulling us towards a goal. In another light, we can view this as our highest values. The items in our lives that automatically utilize the majority of our focus and energy. So, how can I identify my intrinsic drives/highest values? Let’s find out what they are with an easy exercise. What's in your personal space? What do you love to take about? For each question, list the top 3 things that come to mind. *One rule, you can’t use specific people in your life or feelings (IE- your spouse or love). The selections need to be particular things, activities, etc. that best fit those questions for YOU. Then, take those responses, tally up the numerical count and highlight the top 3. Those responses are the pieces in your life that are of the highest value to you. They inspire you from within. You don’t have to think about them, you do them. They are a part of you. If some of those responses are not what you expected, that is ok. Some of our responses can change over time, but most of them will remain fairly the same. And that is why I would recommend you complete this exercise 3-4 times per year to check in and see where you actually are relative to where you think you are. Take some time to self-reflect on the results. Are there a few values that you wish to adjust knowing the impact on your life would be much greater? Highlight those pieces. In the next blog post, I will breakdown how we can realign our values, and/or goals, to adjust our behaviors towards a more fulfilling future.